For the movie by Baz Luhrmann, see Romeo + Juliet. Romeo and Juliet is a play written by William Shakespeare. It is set in Italy and is about the love between two young people from noble families that are enemies. Romeo and Juliet has always been one of Shakespeare's most popular plays. It has been adapted to opera, ballet, television productions, and movies. The noble families of the Montagues and the Capulets live in the city of Verona. Both families are enemies, and even their servants get into fights with each other. Prince Escalus, the ruler of the city, tells the families to stop fighting or they will be punished. Montague has only one child, a teenage boy called Romeo. Capulet also has only one child, a beautiful 14-year-old daughter called Juliet. One evening, Romeo sneaks into a party at the Capulet's house. He meets Juliet and they fall in love with each other. Later on, Romeo overhears Juliet standing on her balcony admitting her love for him. He reveals himself and they agree to be married. Friar Laurence agrees to marry them in secret the next day. Juliet's cousin Tybalt confronts Romeo, angry that he sneaked into the party. Romeo's friend Mercutio steps in and fights Tybalt. Tybalt kills Mercutio, so Romeo takes revenge and kills Tybalt. The Prince orders Romeo to leave the city, and warns he will be executed if he returns. Romeo secretly spends the night with Juliet before leaving the next morning. Juliet is left upset after Romeo leaves. To cheer her up, her parents arrange for her to quickly marry Paris, a cousin of the Prince. This only makes it worse. Juliet refuses, so her father threatens to kick her out if she doesn't marry Paris. Friar Laurence suggests a drug that can put her to sleep for a few hours, so that she can pretend to be dead, so that she can sneak out with Romeo. The Friar sends a message to Romeo to tell him about the plan. Juliet takes the drug and her family, thinking her to be dead, lay her in the family tomb. But before the messenger can reach Romeo, he learns of Juliet's "death" from someone else and believes she is really dead. Romeo goes to the tomb and is discovered by Paris, who has also come to mourn her. They fight, and Romeo kills Paris. Still believing Juliet to be dead, Romeo poisons himself. Juliet wakes up, but when she sees that Romeo is dead, she stabs herself. The play ends with the families and the Prince entering the tomb and discovering them dead. In their sadness, the families agree they should no longer be enemies with each other. Because this play was written in the 1500's, the English language that it uses is not exactly like the English that is used today. Some of the play is written in poetry. In modern English we say "you" for one person and "y'all" for more than one person. But in Shakespeare's English, he often writes "thee" and "thou" when it means just one person. Juliet says "If they do see thee, they will murder thee!" Many words are used a little bit differently to the way they are used today, and other words are used that are now only used sometimes in poetry. Examples: "morn" for "morning; "morrow" for "tomorrow"; "woe" for "unhappiness". Romeo and Juliet, like many of Shakespeare's plays, is written in several different forms. Some of it is prose, which is like normal speaking. The servants in the play usually talk in prose. For example, two Capulet servants are planning to cause trouble with two Montague servants who are walking down the street. Sampson: "Let us take the law of our side! Let them begin!" Sampson: "I will bite my thumb at them, which is a disgrace to them, if they bare it!" Some of the play is written in poetry which rhymes on the ends of the lines. Checkering the eastern clouds with streaks of light." de-dah de-dah de-dah de-dah de-dah. "The clock struck nine when I did send the nurse! In half an hour, she promised to return!" The play finishes with two lines that rhyme. This is called a rhyming couplet. This old house in Verona is called the House of Juliet. Messages are stuck into the bricks. Of all the scenes that have ever been written in plays, one of the most famous is in Romeo and Juliet. After Romeo and Juliet have met at a party and fallen in love, Juliet goes up to bed. But she cannot sleep so she stands at her window and pretends she is talking with Romeo. Romeo is going past and says "But soft, what light through yonder window breaks? ...It is my Lady! O, it is my Love!" Juliet, not knowing he is there, says "Romeo, Romeo, wherefore art thou Romeo?" (Romeo, Romeo, why do you have to be who you are?) She wishes he was not called Romeo Montague but had some different name, so he was not an enemy. This romantic scene has been acted and copied many times, sometimes seriously and sometimes for fun. One well-known scene that took its idea from this, is from West Side Story, a musical by Leonard Bernstein, which takes place on a fire-escape landing with the lovers, Tony and Maria, singing the lovesong, Tonight. 1908 - Romeo and Juliet, a silent movie was made by Vitagraph Studios in the US. Directed by J. Stuart Blackton, the movie starred Paul Panzer as Romeo and Florence Lawrence as Juliet. 1936 - Romeo and Juliet, produced by Irving Thalberg and directed by George Cukor of Classical Hollywood with Norma Shearer as Juliet and Leslie Howard as Romeo, but many critics said that the actors were too old. 1968 - Romeo and Juliet, directed by Franco Zeffirelli. This movie was made in Italy, with Olivia Hussey, who was 15, as Juliet and Leonard Whiting, who was 17, as Romeo. The costumes won an Oscar. 1996 - Romeo + Juliet, directed by Baz Luhrmann, with Leonardo DiCaprio as Romeo and Claire Danes as Juliet. This very colourful version has a modern setting. 2013 - Romeo + Juliet, directed by Carlo Carlei, with Douglas Booth as Romeo and Hailee Steinfeld as Juliet. The Church of San Zeno where, by tradition, Romeo and Juliet were secretly married. 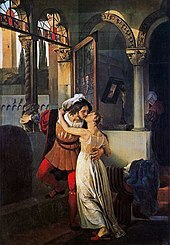 1839 - Berlioz wrote a symphony called Romeo and Juliet. 1867 - Gounod wrote an opera called Roméo et Juliette. 1869 - Tchaikovsky wrote a symphonic poem called Romeo and Juliet. 1936 - the first performance of Prokofiev's ballet, Romeo and Juliet. 1978 - Madero Richard. Costandinos, a French composer, wrote a disco opera titled Romeo & Juliet, which was released as a double album. The sun is hiding his face in sadness. Go away and discuss the sad things that have happened. Some people will be punished for what they have done, and other will be pardoned. Than this story of Juliet and her Romeo."